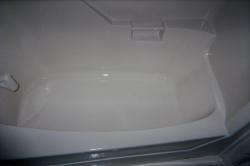 Refinishing is the most economical and efficient way to revitalize your bathroom, at a mere fraction of the cost of replacement. Fixture replacement involves not only the cost of new fixtures, but also replacing the wall, tile, wallboard, tile floor and subfloor. Also, pipes and hardware which are damaged during the removal of the tub. Combined these can be very time consuming. With reglazing you can change the color of your existing fixture to practically any color imaginable. You are able to reglaze fiberglass, steel, porcelain, or enamel. Reglazing, when done by a skilled refinisher, using high-quality product, can completely restore the beauty and luster your fixtures once knew. Or it can complete that renovation project that will make over your house. Give us a call and we will be pleased to discuss what we can do for you!